The Alaska Board of Fisheries (board) will hold a meeting beginning at 1:00 p.m., July 17, 2018. The meeting will be held at the Egan Civic and Convention Center, 555 West 5th, Anchorage, Alaska. The purpose of the special meeting is to address an emergency petition from the Kenai River Sportfishing Association received May 16, 2018, regarding additional hatchery production in the Prince William Sound. At the meeting the board will consider whether an emergency exists under 5 AAC 96.625 and may consider whether to adopt emergency regulations under AS 16.10.440(b) to amend hatchery permit terms. This meeting is open to the public. Written comments, due by July 9, may be mailed to: Boards Support Section, P.O. Box 115526, Juneau, AK 99811-5526, emailed to dfg.bof.comments@alaska.gov, or entered on the Board’s main webpage at www.boardoffisheries.adfg.alaska.gov. The board is not taking written comment or oral public testimony during the meeting. 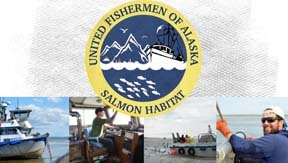 A live audio stream of the meeting is intended to be available on the Board’s website, which can be accessed at www.boardoffisheries.adfg.alaska.gov. Please note the board will not be taking public comments at this meeting, therefore getting written comments in by the July 9 deadline is of the upmost importance.